The Calgary Flames returned home from a desert road trip that produced mixed results. On one hand they dominated the Coyotes, but on the other they were shutout by the Golden Knights. The Flames were looking for more of the former as they were back in the Saddledome to face the visiting Dallas Stars. Playing on the second night of a back-to-back, the Stars were the ones who got off to the better start. Jason Spezza opened the scoring less than a minute into the contest, after sneaking in from the point and roofing his shot. Although the Flames would continue to control play from there, they would still find themselves trailing for the majority of the period. Luckily, a late goal from Garnet Hathaway that just trickled by Anton Khudobin would net things at one apiece entering the first intermission. 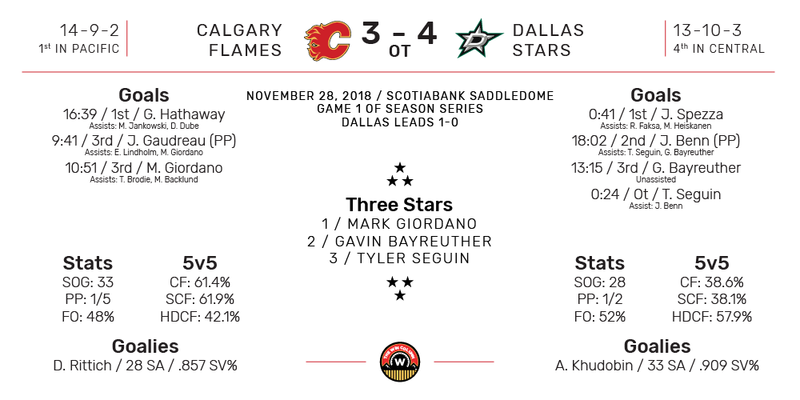 The second period was tilted more in the favour of the Stars, as they were able to mute Calgary’s offence, while simultaneously generate more chances. They would finally solve their own power play issues later in the period, as Jamie Benn would pot the goal off a beautiful saucer pass from Tyler Seguin. The Stars held the 2-1 lead entering the final frame. Cue the Calgary Flames third period magic? The Flames would indeed continue their trend of third period prowess, as two quick goals from Johnny Gaudreau and Mark Giordano would give the Flames the 3-2 lead. Unfortunately, the Flames wouldn’t be able to maintain that lead for very long, as a goal from Alexander Radulov would tie things at three. Chances were exchanged, but the teams would eventually take the contest to overtime. In the extra frame, a miscue behind the Flames net would lead to the Stars regaining possession. Eventually the puck would make its way back to the front of the net, and Seguin would bury the game winner behind David Rittich. Rittich would protest profusely that he was interfered with moments before by Benn, but alas, the goal would stand. With the point, the Flames lead atop the Pacific Division ahead of the San Jose Sharks by one point with a game in hand. Sean Monahan and Gaudreau also controlled possession last night, posting CF%’s of 67.9% and 66.7%. A point is still a point. There are folks that may still be sour on the overtime marker, myself included, but the mistake happened well before that. Rittich was unable to get the puck to his own player behind the net, and that just sunk them on the whole sequence. What’s done is done. There are a few things that are worth mentioning from last night’s contest. On a positive note, it was great to see the team come back once again and secure the extra point. Based on how well Khudobin was playing, and the Flames’ inability to get pucks through shooting lanes, I would say they fared well. What I noticed most last night, and I hate to keep beating the same drum, but Neal seemed very out of place in the offensive zone. Perhaps I never saw him play enough before joining the Flames, but he always appears to be wandering in the center of the attacking zone. He doesn’t do enough proactively to make himself open, but is also quite laissez-faire with the puck when he does eventually get control. I chalk this up to confidence, as he easily is operating with zero at the moment. I think once he can score a few more goals, and he will score more goals, the monkey will fly off his back and allow him to revert back to his scoring ways. I don’t think Mikael Backlund had his best game either last night. He doesn’t appear to be the same player he was last season, and seems to be struggling on both ends of the ice. Points usually come in bursts with Backlund and his defensive game would make up for it. At the moment, both sides of the ice don’t appear to be going in his favour. It’s not terrible, it’s just not the same standard we are used to with Backlund. Gaud: Giordano continued his Norris-calibre season last night with the aforementioned goal and assist. He now sits with 24 points through 25 games this season, in addition to his defensive game being of the highest class. Bad: Backlund posted a 23.1% faceoff winning percentage, and was a step behind on most shifts. Ugly: Monahan and Gaudreau, although on the ice for the 2-2 goal, were both on the ice for three goals against; including the overtime winner.